Solange Knowles always makes unexpected red carpet choices which is why she is a favorite on th carpet. She attended the Kawakubo Comme des Garcons-Art of the In-Between 2017 MET Costume Institute Gala this evening(May 1st) at the Metropolitan Museum Of Art in New York. 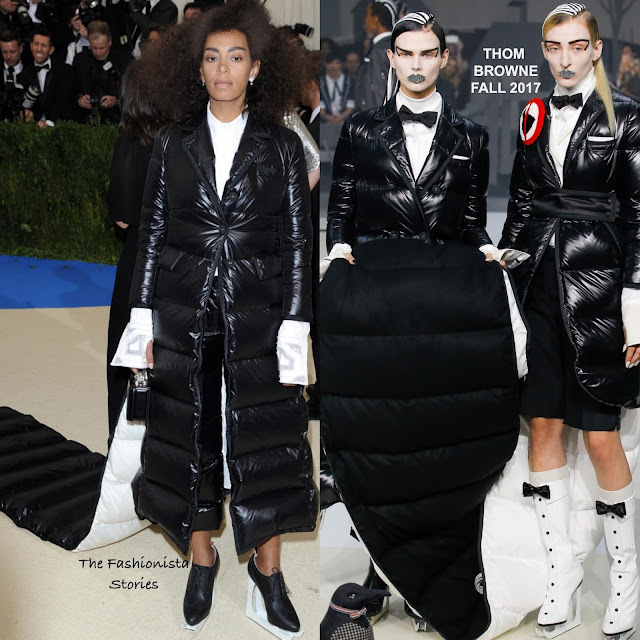 The singer skated on the carpet wearing head to toe THOM BROWNE FALL 2017 which featured a black down coat with a train detail, a white shirt dress and black leather ice skating oxfords. Love the natural hair and make-up look and her ensemble is definitely took on the theme of the night. The MARK CROSS 'Grace' mini box clutch finished up her look. Are you loving Solo's look as well?